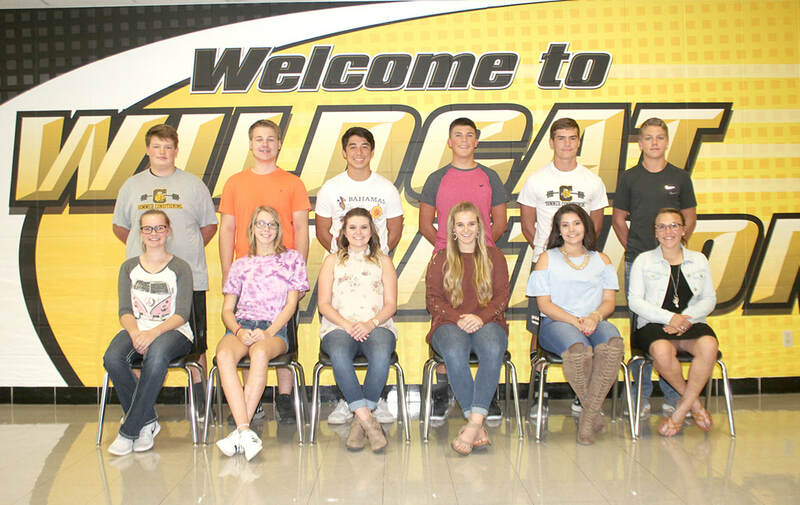 Cassville High School announced their 2017 Homecoming court. Students are pictured above from left to right. In the front row: freshman Laney Roller, daughter of Bobby and Christi Roller, of Cassville; sophomore Bailey Saffold, daughter of Bob Saffold and granddaughter of Bob and Sharyn Saffold, all of Eagle Rock; senior Rachel Scott, daughter of Shawn and Terissa Scott, of Cassville; senior Jesse Edie, daughter of Jamie and Chuck Edie, of Cassville; senior Sarah Field, daughter of John and Elisha Field, of Golden; and senior Schauna Dilbeck, daughter of Rusty and Staci Dilbeck, of Butterfield. Back row: freshman Wesley Stockton, son of April and Jarod Stockton, of Cassville; sophomore Cole Stringer, son of Melanie and Scott Stringer, of Cassville; senior Garret Knight, son of Sally and Eric Knight, of Cassville; senior Dalton O’Neill, son of Jake and Jennifer O’Neill, of Cassville; senior Braden Strahan, son of Keri and Dale Strahan, of Cassville; and junior Reilly Nichols, son of Melanie and Randy Grossman, of Cassville.